Dr James Tweedley from the School of Veterinary and Life Sciences and a team of researchers have been monitoring prawn numbers, their breeding habits and which predators eat the newly-released prawns since October 2013. 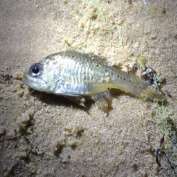 Their findings have shown that the little known, but aptly-named 'gobble guts' fish is taking most of the juvenile prawns in their field experiments. Dr Tweedley said the locations and timings of the latest releases of 400,000 prawns into the rivers on Wednesday, March 2, had been carefully selected, as were the previous releases, because of predators like the gobble guts. "Having researched the environmental preferences of the prawns and identified the fish species that eat them, we are able to select the best places to release the prawns to ensure maximum survival," Dr Tweedley explained. "As gobble guts prefer dense seagrass and are more abundant and active at night, we are releasing the prawns during the day into mainly sandy areas. The prawns are nocturnal too and so when we release them during the day they swim to the bottom and bury themselves, which hides them from predators. "Our findings suggest that, contrary to popular belief, the dreaded blowfish is not a significant predator of the juvenile prawns. "While blowfish are the scourge of recreational fishers who will tell you that they eat the prawn baits off their hooks quicker than any other fish, it's the gobble guts that are taking most of the juvenile prawns." These dietary insights have been revealed by Murdoch PhD researcher Brian Poh, who found around 300 prawns in the gut of a single gobble guts which was only 45 mm long. The releases last week brought the total number of prawns released since the start of the project in 2013 to four million. Although the prawns are only small (three mm) when released, they will grow and breed by around Christmas this year and help in the future sustainability of the population. The production and release of prawns has been funded through two rounds of investment of recreational fishing licence money. The first led to the development of world first spawning techniques and the stocking of 2.5 million prawns. The second capitalised on this research and resulted in an additional 1.5 millions prawns being stocked in the Swan and Canning rivers this summer.